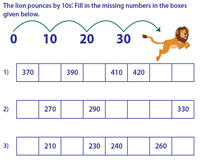 Skip count by 10s worksheets are based on number line, backward counting, money, maze and connect the dots. 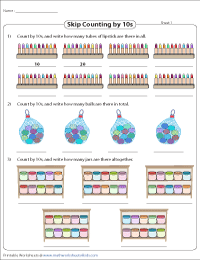 There are over forty worksheets available in this section. Each topic has a unique theme to attract young learners. 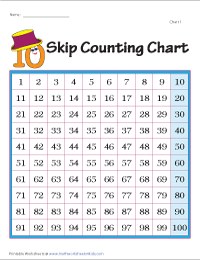 The following charts can be used to learn skip counting by 10s. 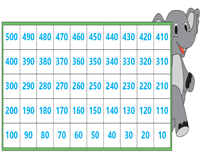 Students can count forward using the charts and instantly practice using the partial and blank charts. 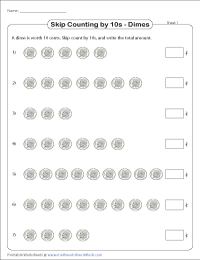 Introduce reverse skip counting by 10s with the display worksheets. 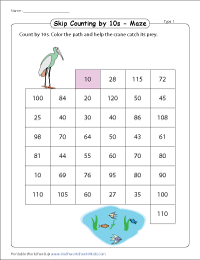 Follow up with the partial and blank charts to test skill. 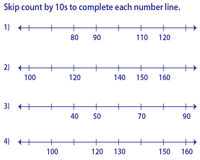 The number lines are at intervals of 10. Count by 10s to complete the number line. Each group consists of 10 items. Skip count by 10s to find the total. 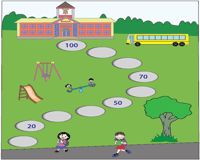 Help Beth and Natasha find their way to school in easy level. Help Helen reach the apple tree in moderate level. Skip count by 10s to complete the task. 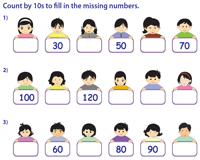 Fill in the missing numbers by counting in 10s. Each worksheet has five problems. The lion pounces by 10s'. Skip count by 10s to fill in the missing numbers. 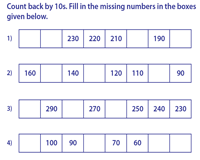 Count back by 10s to complete the missing numbers. A dime worth ten cents. Count by 10s to find the total amount. Count by 10s to solve each maze. Difficulty level of the maze increases from type 1 through type 3. 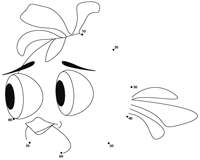 Join the dots by skip counting in 10s. Find the hidden picture.